If I ever win the lottery, I plan to devote my life and my fortune to finding Bigfoot. I'm not joking. Of course, I might not tell the world if I found him/her. (Because you know there's some doofus out there who would pay anything for a Bigfoot head on his wall.) But I want to know for myself if there really are super-sized ape-men roaming the planet. I suspect there are. Why? Because practically every heavily-forested area on earth--from the Amazon to Appalachia--is said to be home to a Bigfoot-like creature. I've done posts on ape-men of the world, but new ones keep popping up. Like the Ohio Grassman. Grassmen are large, hairy beasts that reside in the forests and fields of Ohio. They're thought to have been given their unusual name by early European settlers who spotted the creatures slinking through the tall prairie grasses and mistook them for an unknown tribe. Though similar to Bigfoot in many ways, the Grassmen often travel in groups, and are believed to be more social than their solitary cousins. I recently watched an episode of Monster Quest that featured the Ohio Grassman. One of the more intriguing pieces of evidence to be presented was an elaborate "nest" that had been discovered in the middle of the woods. I've watched a lot of Bigfoot shows in my day, and I've never seen anything quite like this. In related news, the BBC News website recently featured an article about the mande barung (shown below), a peaceful, fruit-eating ape-man that lives in the forests of India and Southeast Asia. Read more here. I remember watching an Angela Anaconda episode(it's a kids show) where they go camping and find big foot. What is a Yeti though? I it the same as bigfoot? Is bigfoot a conspiracy theory? Like alien abductions? I have relatives in Ohio. Their kid could pass as the Grassman. RI: The yeti is a Bigfoot-like creature that lives in the Himalayas. It's also known as the Abominable Snowman. I don't think Bigfoot is a conspiracy. (Are you thinking X-Files?) But I do think a lot of the sightings are probably hoaxes. 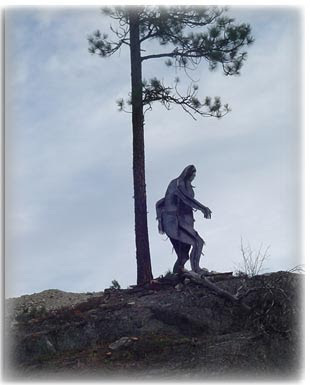 The most credible theory (in my opinion) is that Bigfoot is a species of primate that's related to a large, prehistoric ape known as Gigantopithecus. I will be going to NYc this summer. Any ideas on where to go? Yeah something on big foot!!!!!!!!!!!!!!! Awsome! is there anything crazy or interesting out there? it sounds kinda boring. have you ever hear of Akiane ? google her Ananka ! she is a really really amazing artist, and she's thirteen. she is a child prodigy/genius in artistic ability please post about her Ananka! Firstly awsome!!!!!!! Next I was wondering is there any way to contact you if I have a strange storie for you? PLEASE TELL ME!!!!!!!!! that's awesome! i love weird things. spiffy: anywere! it's awesome! go to greenwhich village, and see the downtown sights to. i like radio city music hall, it's really cool. have fun! *grin* I decided if anyone ever wants to marry me part of the requirement is that he has to be willing to spend our honeymoon hunting bigfoot in the Pacific Northwest. hey, do you think that sometime you could post something about a Chubracabra?i dont know if i spelled that right. and is there going to be another book!?!?!?!?!!?!?!?!?!? I have a question: Is does the Big Foot hibernate? ?o? Third, just walk around Greenwich Village. This is the part of the city where Kiki Strike was set, and its buildings are some of the oldest in NYC. There are also lots of cute cafes and places to get lunch. Also, the Bridge Cafe near South Street Seaport (#279 Water St.) is the oldest restaurant in NY. It's good for lunch. And as for museums, they're all great, but my favorites are the Merchant House Museum (4th St.) and the Lower East Side Tenement Museum (90 Orchard St.). The last one is an absolute MUST! GW007: Thanks for the tip! I will check up on it! Cupcakedoll: I don't know about that. You sound like one cool chick. Tony and Tia, eh? As for Kiki, no siblings. But there will be a book #3! Kitty: Good question. We'd have to check how many sightings are made in the winter. cupcakedoll, your awesome!!! but if you really find someone good, that won't matter. I actually saw one. Mitchell Memorial Forest in Southwest Ohio in the fall of 2005. It did not look anything like a "bigfoot", was not friendly, and was very fast. It followed us for a while before it just stood there, very still- then charged us. 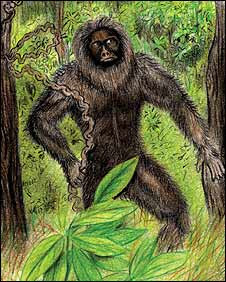 It was very very thin, definately a predator and it ran on the balls of it's feet, not it's heels like an ape or a human. It had no fear of humans at all, ran right at us and I had no intention to find out what it wanted. We got in my truck and tore out of there. It didn't look anything like any picture I have ever seen. It's shoulders were as wide as it's hips, and it's legs were very long as well as it's arms. It had light brown fur and it's face did not look ape like but more human like except with much larger eyes, and a sunken in nose. It didn't make any noise but I've read several accounts of these things- ALL of them I believe to be fake except for a very few handful. What I saw made me realize there are creatures yet to be discovered and better left alone. like no way I wroted about the ohio grassman tooo. http://themysteriousnessoftheunkown.blogspot.com/ sweet. i hope you can give my some pointers on some of theese creatures. Clued-up post! I am delighted to know your valued intelligence. Thanks!! !